Unless you are a Quaker or you just got released from prison or the county jail this morning. You probably watched the Los Angeles Lakers beat the Boston Celtics 83 to 79 to win back to back NBA championships last night by outscoring the Celtics 30 to 22 in the fourth quarter. I am not a Lakers fan nor am I a hater. L.A. winning last night doesn’t piss me off even though I predicted that the Celtics would beat L.A. in seven games. I can admit when I am wrong and eat crow and be gracious about it. I can also give credit when credit is due. The Lakers did what I didn’t think they had the ability to do. L.A. beat a team that was mentally, physically tougher and more talented than they were. 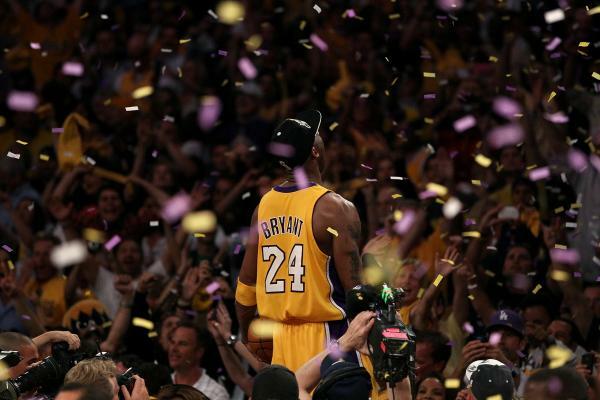 Out of all of the championships that L.A. has won since Kobe has been there, this one to me is the most significant one and makes me respect them more than I ever have. So congratulations to the Lakers and the city of L.A. and their fans. I hope the city of L.A. and every Lakers fans around the world enjoys this championship for as long as you possibly can. I am sure Ron Artest and the rest of the Lakers are. Ron Artest is probably still sitting in a club or lounge somewhere in L.A. telling stories of how the greatest basketball player that he has ever seen or played against was a dude named Mike Chathway from Queens Bridge, New York who went to jail or died last year; or how Michael Jordan said that he wished that he would have played against him (Artest) in his prime. I swear that boy isn’t right in his head, but I am happy for him for some odd reason. Somewhere Kobe Bryant is doing what God only knows Kobe does during his off time when he isn’t doing lame commercials of him doing soccer celebrations, participating in photo shots of him wearing weird all white outfits or jumping over Ashton Martins driving towards him at 60 MPH. Maybe he is at home with Vanessa planning his next attempt to immolate Michael Jordan’s mannerisms as he did last night after the game by jumping on the scorer’s table with the ball in his hands holding up five fingers like Jordan did after winning his fourth. I have always defended Kobe when people would say that he tries to imitate things that Jordan did and said during Jordan’s career. I never saw what people were talking about until last night. That Jordan like stunt that he did after the final buzzer really caught my attention. Kobe has become just as consumed as we are as fans when it comes to comparing him to Mike that he seems to think that he needs to act like Mike at times. The one thing that Kobe didn’t do a good job of last night was imitating how well Jordan typically played in NBA finals games. Kobe was horrendous all night long except in the last two minutes of the game when he hit a big shot and grabbed two key rebounds to help the Lakers complete the comeback over the Celtics. When he wasn’t missing shots, or dribbling the ball off of his feet, he looked out of sync and frustrated at times. A good example of how bad Kobe was last night was displayed in the second quarter when he got the ball at the three point line and had Rasheed Wallace in front of him about three feet away. Instead of pressuring Kobe, Wallace backpedalled to go position himself under the basket for a rebound and let Kobe take a wide open three pointer which he missed. He was that bad at times last night. Ignore the 23 points that Kobe scored and the finals MVP award he collected. Those points and MVP award are very misleading of how Kobe actually played last night. Overall the Lakers didn’t play well at all. They shot poorly from the field due to the Celtics tough defense and poor shot selection from several Lakers players, and L.A.’s free throw shooting wasn’t anything to brag about either except for in the fourth quarter when they needed every point to win. Besides hitting key free throws in the last three minutes of the game, there only saving grace was their great offensive rebounding, and Ron Artest and Pau Gasol. Ron Artest and Pau Gasol stepped up and played big throughout the entire game and were the ones who led the charge late in the third quarter to come back from a thirteen point deficit. Derek Fisher didn’t play extremely well last night but he came through with a huge three point shot in the fourth with two minutes remaining to tie the game. Despite Kobe’s off night and the Lakers overall average to subpar play. Game seven was by far the best game of the series. At the same time this game displayed what the entire series had been all about; two good teams who at times couldn’t find a way to put it all together to play a complete game. For three quarters the Boston Celtics looked like the team that we saw in games two, four and five. Then at times they looked like the team we saw in games one, three and six. Paul Pierce and Rajon Rondo, Kevin Garnett came to play and played well at times and so did Rasheed Wallace. But they disappeared in the fourth quarter when they were needed the most. While the Celtics were playing like the team we saw in games two, four and five through three quarters of game seven. L.A. was playing like they did in games two, four and five and pretty much played like that the entire game. The game basically came down to which one of the two underperforming teams could make big plays down the stretch in the fourth quarter since both teams had reverted back to old habits in the fourth. Five years from now when people talk about this game. They are going to talk about how great both teams played defensively and how poorly Kobe Bryant played in maybe one of the biggest games in his career to date. Some may mention how Ron Artest played big for L.A. all night, then thanked his psychiatrist and promoted his upcoming rap album during the post game interview. However people choose to talk or remember game seven of the 2010 NBA finals. 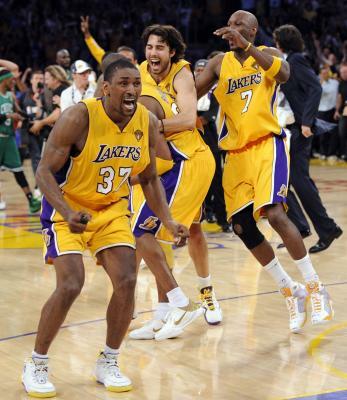 It will ultimately be remembered as the night that L.A. got revenge on Boston for the loss in the 2008 NBA finals. Once again, congrats to the Lakers. Dam I was so unhappy that the Celtics lost because I just flat out don’t like cheering for a team that wins so often over so many years. But it wasn’t like the Lakers even played well to deserve the vicotry the Celtics just played worse. I really thought that Celtic will become the champion for this season. I don’t like Kobe .